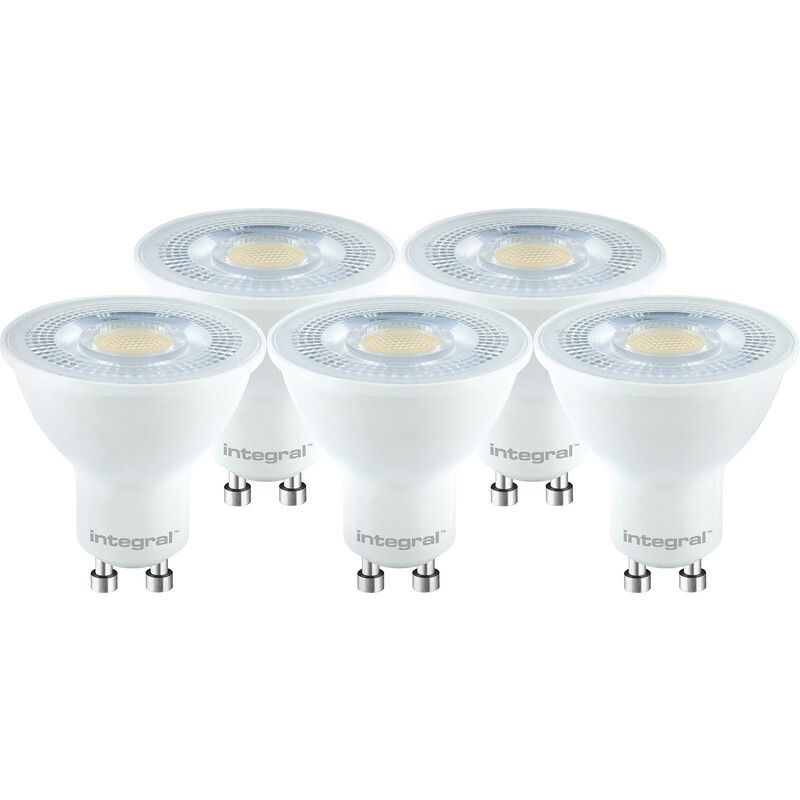 Integral LED Classic GU10 Lamp Dimmable 7W Warm White 460lm A+ (5 Pack) is rated 4.7 out of 5 by 13. Rated 5 out of 5 by Capn B from Fit well and a good clean light These lamps work well so far but time will tell. Rated 4 out of 5 by Adrian639 from Cool white I got these to go with my other cool white lamps for the kitchen.they are ok but not what I would call cool white,more sunny orange in comparison to the other lamps I have but they are nice and bright. Rated 5 out of 5 by pete3266 from Superb Best GU10 LED bulbs on the market, super bright. Rated 5 out of 5 by Twobins from These are the best 50w equivalents Bought five of these to see if they were as good as the reviews. These are the closest I’ve seen to 50w halogen gu10s. So impressed I bought another ten to replace all the gu10s in the house. Rated 5 out of 5 by Sparks 1066 from Well Done Toolstation Finding an LED GU10 that's close to the colour render and output of a standard 50w Halogen may sound like an easy task but it's not. The LED market is still in its infancy and over the last few year manufacturers claims of life expectancy and words like 'direct replacement for a 50w halogen' are often far fetched, to say the least. The LED industry has little if any standards to work to and it's pot luck if the product you buy actually achieves the manufacturers quoted criteria. So what can you do? In general, read the reviews, speak to a friendly sparks to see what they recommend and take a punt - trial a few different lamps. So after trying various lamps, when I found this GU10 the search was over. If you want a 50 halogen direct replacement - this is it. For me 2700k is the right colour render for a warm white that's as close to halogen as you will find. 3000k is slightly too cool. 520lm is subjective as any lighting designer will tell you - as it's dependent on the surroundings. That said this lamp is as bright if not slightly brighter than the 50w halogens it was intended to replace. It says on the pack replaces 65 w halogen - again subjective - but it's not far out. I can't comment on the expected life of 15000 hours - this could be a complete fabrication as there are few if any manufacturers who comprehensively test LED's. The only negative is it's a plastic body - so unsuitable for some types of fittings where the lamp is exposed. But in flush fit - it's perfect. From experience - buy several extra as it's unlikely the lamps will be available long term - otherwise you will be back to searching for an equivalent lamp once they start to fail. If you really want to find out the truth about the LED industry go to the LUX LIVE trade event at the Excel centre (London) in November each year.